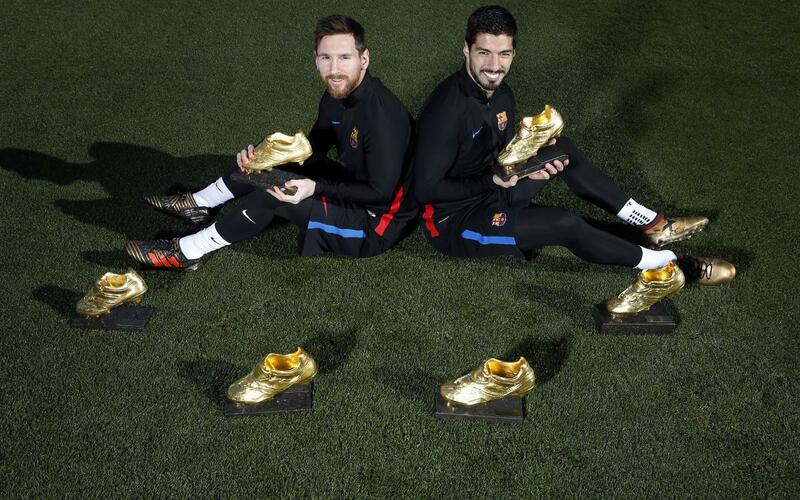 Leo Messi and Luis Suárez pose with combined six Golden Shoes! In a photo that represents a second coming of the Gilded Age in Barça-ville, the team’s star strikers, Leo Messi and Luis Suárez, posed for a photo on Wednesday at the team’s training facility surrounded by their half dozen combined Golden Shoe awards. The image, which captures the South Americans seated on the grass with all six—four for Messi and two for Suárez—of their Europe’s top scorer trophies, will be the cover photo for the newest issue of Barça Magazine. Interestingly, the Golden Shoes that appear in the photo are not replicas—no, they are the original awards, which the players brought from their homes. Messi’s four Golden Shoes are tied—with Cristiano Ronaldo—for the most ever, and the latest came just last month. Messi’s 50 goals were tops in Europe last season. Suárez won one of his with Liverpool—after scoring 31 goals (also tied with Ronaldo) in the 2013/14 season—and has added another with Barça.